To rent either classroom or large hall space, contact the office at office@albanyuu.org or (518) 463-7135. Our facilities can accommodate a variety of special events from concerts and weddings to theatrical performances and nonprofit fundraisers. Community groups rent rooms on a monthly basis for various support groups; teachers rent space to give workshops; an organization can hold meetings they can’t accommodate in their own space or even an off-site retreat. Weddings are held in the sanctuary, and can be followed by a reception in Channing Hall. The Community Room, which can seat 300 people with flexible seating, is also available for conferences and social events. 3. Advocating for public policies that are in line with our UU values and principles. The Sanctuary, halls, and classrooms may be rented by members of the congregation and by non-members. Arrangements for either can be made by contacting Sapphire Correa at the church office (518) 463-7135 or office@albanyuu.org. ACCESSIBILITY: There is a handicapped accessible ramp at the Washington Avenue and the West Street entrances as well as an elevator that provides access to all floors. PARKING: Situated in downtown Albany, parking is on the street. 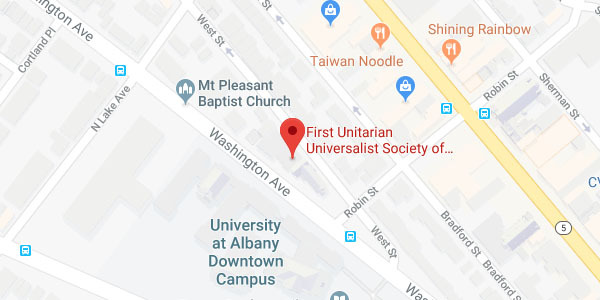 On special occasions and only when classes are not in session at the University at Albany (across the street) we can request permission to use their parking lot. Four to six weeks lead time is needed to gain this permission. There is also a municipal lot two blocks east of the church on Washington Avenue. INSURANCE: All renters will provide a certificate of insurance for their event. Typically this is provided by your homeowners’ or business’ insurance company. If you hire a caterer or DJ they will also need to show proof of insurance. FURNITURE: Tables and chairs in all rooms can be arranged as you wish. Non-profit and member renters are responsible for setting up the rooms and putting them back the way they found them. Set up/reset by staff is also available for a fee. When we know the furniture needs of a room’s next user, we will notify you that you may leave out certain items instead of putting them away. KITCHEN USE: We allow private caterers to deliver and serve food at our facility. Or, you can bring meals or refreshments in for your group. When your event ends, you (or your caterer) are responsible for clearing the rooms of all food, beverages and garbage. Janitorial supplies are provided. For rentals that include kitchen privileges, a portion of the shared refrigerator and freezer space may be available, but you would be well advised to bring cold items in coolers as the refrigerator is often full. FOOD: If ‘take out’ food is consumed we ask that you bring the food garbage to the kitchen for disposal. Otherwise, if trash pickup does not occur promptly, the next room user may be smelling the remains of your meal. EQUIPMENT: Sound equipment (microphones and speaker systems), easels, TV/DVD players, video projector, pianos (with the approval of our music director), are available on request. Renters must provide their own paper and markers for the easels and their own laptop to use with the projector. HEATING AND AIR CONDITIONING: Community Hall and the library (opened in 2007) are fully air conditioned. In the Religious Education wing (1962 building) offices and some classrooms have window air conditioners. Channing Hall and the Sanctuary (1924 building) are also fully air conditioned. All heat is operated by timed thermostats and is set by staff for your event. Please do not change thermostats. SMOKING: Allowed only outside the building on Washington Ave. Please use receptacles.